I ordered 4 of these units for a major property refurbishment. They arrived in good order and on time. The Push Plates included by Grohe in the sealed packing boxes were not as advertised by Bidet Showers but this was rectified immediately and without question by Lucas at Bidet Showers. Great service, thank you. GROHE RAPID SL Frames for wall-hung sanitaryware. The Rapid SL system gives you the freedom to design your ultimate bathroom by providing a secure and quick method of installing wall-hung basins, bidets, urinals and WCs. Available in three different installation heights, each frame comes pre-assembled with sanitaryware fixings and is subject to stringent testing – our WC frames are tested to hold 400kg. GROHE WHISPER® TECHNOLOGY Opt for GROHE Whisper® Technology for the ultimate in design freedom, comfort and peace. All GROHE concealed systems feature Whisper® Technology. Decoupled pipe supports prevent sound transfer to the structure of the building when water is released from any GROHE concealed cisterns into the bowl. There is no risk of noise disturbance so that you can plan your bathroom exactly how you want and ensure your WC is in the location you decide, not where restrictions dictate. 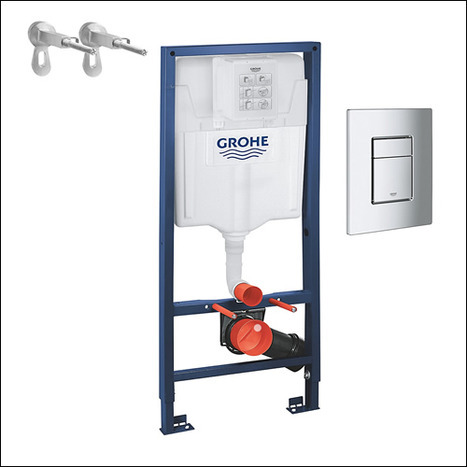 This GROHE technology ensures that there is no irritating noise or water hammering • Most silent product (in its category) in the industry due to technical optimalisation • All GROHE fittings are tested by German Industry Norm (DIN 4109 and 52218) and qualify for the lowest noise group • This feature allows flexible wall constructions and full privacy ABOUT GROHE: Grohe AG is Europe’s largest and the world’s leading single-brand manufacturer and supplier of sanitary fittings, holding roughly eight percent of the world market. As a global brand for sanitary products and systems, GROHE is setting standards in quality, technology and design and its products deliver the perfect flow of water. Precision-engineered and packed with a host of unique features and user benefits, GROHE taps, showers and fittings are in a class of their own. 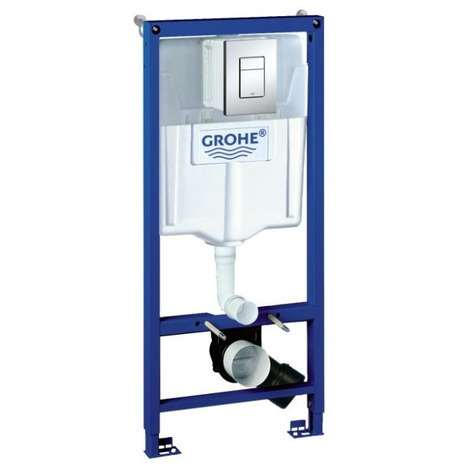 GROHE PRODUCTS – Independently Tested In addition to rigorous internal tests, many of our products compete in independent tests, which compare the performance of our products against similar products manufactured by our competitors. GROHE is one of the leading global brand manufacturers and suppliers of sanitary fittings. Quality, technology, design and sustainability. Four brand values that illustrate GROHE's commitment to creating high level of experiences. GROHE set standards high to ensure that every time you turn on a GROHE tap or step into a GROHE shower you can feel the difference. Incorporating a variety of convenient properties, this installation system of the Rapid SL range is quick and easy to instal thanks to the GROHE QuickFix technology. No tools are required to connect water supply, hose and inspection shaft. The set comes complete with the Skate Cosmopolitan chrome flush plate. 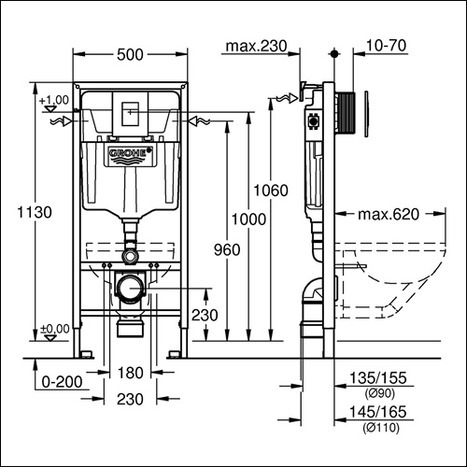 For maximum safety, the steel frame is certified to hold loads of over 400 kg. Installed in front of a solid wall or in a stud wall, the concealed toilet tank and a wall-hung toilet will facilitate your bathroom cleaning. The GROHE EcoJoy dual flush reduces your water consumption by up to 50 per cent and the GROHE Whisper noise control prevents the transmission of sound to adjoining rooms, making the Rapid SL an all-round attractive choice for your home. All GROHE EcoJoy products are systematically designed to save water and energy so that precious resources are conserved. These products, equipped with water-saving technologies, offer the right water experience without the need to compromise. Reducing water and energy consumption goes hand in hand with convenience and attractive design. Less water. Right flow. Thanks to low-noise fittings and decoupled piping, the GROHE Whisper technology prevents any sound transmission to adjoining rooms, leaving the other occupants of the house undisturbed. Undercutting the standard requirement of 24 dB(A), this system's low noise level of only 21 dB(A) was confirmed by Germany's renowned Fraunhofer research organization. Flushing a toilet effectively can be a challenge in buildings with old plumbing. The SpareFlush system provides a solution to this problem: in addition to the regular 6 L flush volume (or 4.5 depending on the ceramic body), it provides an extra volume of 3 L, ensuring an effective flush, even with old plumbing. Connecting the system is easy with ToolFree concept: no tools are needed to connect water supply, flexible hose and inspection shaft. GROHE products are guaranteed to look as beautiful decades on as they did the day you first fell in love with them. The special recipe to success lies in our long-lasting surface quality: GROHE StarLight Technology. Continuous improvement over the last 75 years has seen the plating process refined to produce a robust and immaculate surface that is recognised as one of the best finishes in the world. This is thanks to rigorous quality controls and ongoing investment, giving you a lifetime of enjoyment. GROHE wants to make life easier. GROHE believes that technical solutions should be quick to instal and fuss free. That’s why they have developed GROHE QuickFix. They have listened to our team of loyal installers and researched the needs of customers to create a system that works smarter for both. You’ll find GROHE’s QuickFix precision engineering bringing benefits across all of product categories. German engineering and design go hand in hand to offer quality and performance. Ongoing investment in research and development has enabled GROHE to turn one of the world-leading technologies for bathrooms and kitchens into reality. GROHE products have been created to last a lifetime, to be both easy and intuitive to operate and to make the use of water a pleasure.